Sunrisers Hyderabad hosted Delhi capitals in the 30th match of the season. SRH came to the game after a six days break. That break should have helped them to recover from the two consecutive defeats. Kane Williamson, who was back as the captain for the home side, won the toss and elected to bowl first. Khaleel Ahmed started the proceedings with an excellent opening spell. He took the wickets of both Prithvi Shaw and Shikhar Dhawan to put the visitors on the back foot early in the innings. Colin Munro played an aggressive knock before he got out for 45. Delhi captain Shreyas Iyer and Pant had a decent partnership and took the visitors to a decent position by the 15th over. DC lost the wickets of both Iyer and Pant in quick succession which halted their progress. The visitors could not finish the innings with a flourish as they were only able to post a target of 155 for the hosts. It's no secret SRH rely heavily on their openers David Warner and Jonny Bairstow. The duo didn't disappoint and gave them a decent start as the pair shared yet another fifty-plus partnership in this season. Guyana all-rounder Keemo Paul broke the opening partnership by dismissing the English wicketkeeper-batsman. He also dismissed SRH captain Kane Williamson for three runs to give some hope for the visitors. After losing these two important wickets SRH played cautious cricket which disrupted their momentum. This pushed the required rate increasing pressure on both the batsmen. The man of the moment Paul came back and picked yet another wicket. In-form David Warner got out immediately after scoring a half-century. After that, Sunrisers fell like a pack of cards as they kept losing wicket after wicket. The hosts lost their last eight wickets for 15 runs as they slipped to third defeat in a row. DC won the match by 39 runs to make it three wins in a row. Follow Sportskeeda for all the updates on IPL score, purple cap, points table, schedule, news, orange cap and fantasy tips. 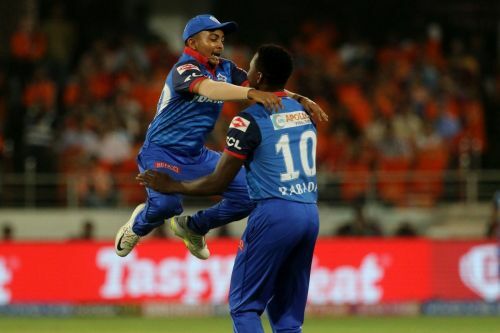 IPL 2019: Match 30, SRH vs DC Match Prediction: Who will win today's match?